Numerous conditions can cause pain behind the ear and down the neck. According to MedlinePlus, a publication of the National Institutes of Health, neck pain can travel to other parts of the body, such as the shoulder, arm and head. In some cases, pain in various head structures can send pain to the neck. Pain behind the ear is often associated with neck pain, as the tendons of many neck muscles insert into the mastoid process--a prominent bony bump--just behind the ear. A cervicogenic headache, sometimes called a cervical headache, can cause pain behind the ear and down the neck. According to the Sports Injury Clinic, cervicogenic headaches are caused by dysfunction in the muscles, joints, nerves or fascia in and around the cervical spine or neck, especially the upper cervical spine. Pain radiates from the neck and the back of the skull toward the front of the skull, causing a dull, aching sensation throughout the head, including behind the ears. Possible causes of cervicogenic headache include nerve compression between the vertebrae or spinal bones, excessive tenderness in the neck tissues due to trigger points--hyper-irritable nodules or knots within a tight band of muscle--and reduced neck range of motion or a stiff neck. Most cervicogenic headaches respond well to conservative care methods, such as chiropractic manipulation, massage therapy, acupuncture and postural retraining exercises. Mastoiditis can cause pain behind the ear and down the neck. MedlinePlus states that mastoiditis is an infection of the mastoid bone of the skull, which is located directly behind the pinna or the outside portion of the ear. The most common cause of mastoiditis is a middle ear infection, also known as acute otitis media. The infection can spread from the ear to the mastoid bone, causing infected materials to accumulate within the mastoid air cells--a network of honeycomb-like structures within the mastoid bone. Infection of the mastoid air cells can cause destruction and degeneration of the bony tissue that composes this part of the skull. Mastoiditis affects children more than adults. Common signs and symptoms associated with mastoiditis include head and neck discomfort, pain and swelling behind the ear, ear drainage, fever, headache, hearing loss and redness over the affected area. Whiplash can cause pain behind the ear and down the neck. According to the National Institute of Neurological Disorders and Stroke, whiplash is a collection of symptoms that occur following a rapid flexion and extension injury of the neck. The most common cause of whiplash is a rear-end motor vehicle accident. Whiplash symptoms range from mild to severe. Moderate or severe cases of whiplash usually involve extensive soft tissue damage to various neck structures, such as muscles, tendons, ligaments and nerve roots--spinal cord offshoots. 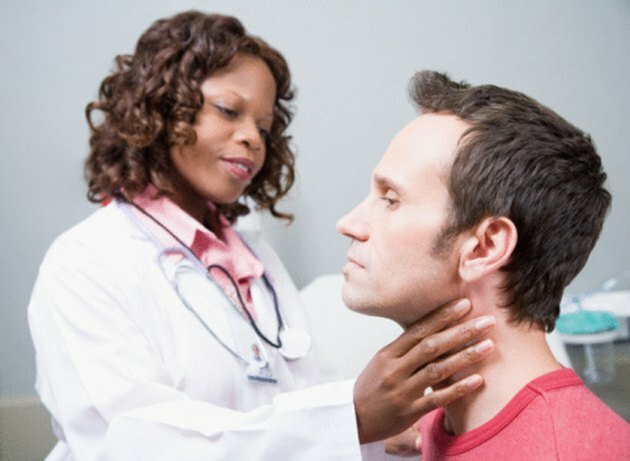 Common signs and symptoms associated with whiplash include neck pain and stiffness, pain behind the ears, neck muscle strains, neck ligament sprains, headache, dizziness, shoulder pain, back pain, memory loss, an inability to concentrate, irritability, fatigue, sleeping problems and depression. The NINDS states that, although most people who suffer a whiplash injury recover within three months, some people may experience residual symptoms that last much longer. National Institute of Neurological Disorders and Stroke: What is Whiplash?